At MBBC, the club owns owns and maintains everything up to and including the stainless swivel on top of the hazelett, and the member owns and maintains everything above that. Although the club owns the swivel, for ease of installation and removal, keep the swivel with your lines during the winter. 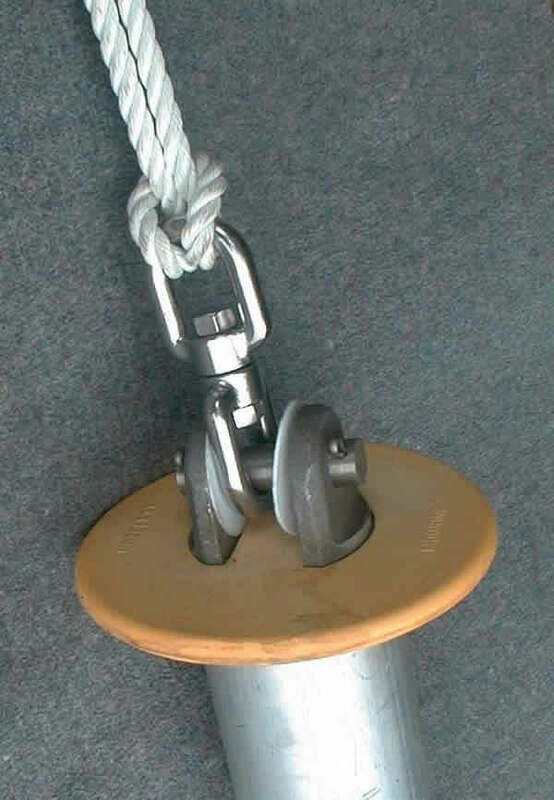 For standardization, the following should help you in the seasonal installation and removal of your mooring lines. Click on photo to display full size. Bumper Installation: While not required, a rubber bumper is strongly encouraged if you want to avoid hull scrapes from the top of the hazelett. The "large" rubber bumper available locally is designed to fit the "D"-type ears shown in Figure #1. Simply drop the bumper over the ears prior to installation of your pin and lines. 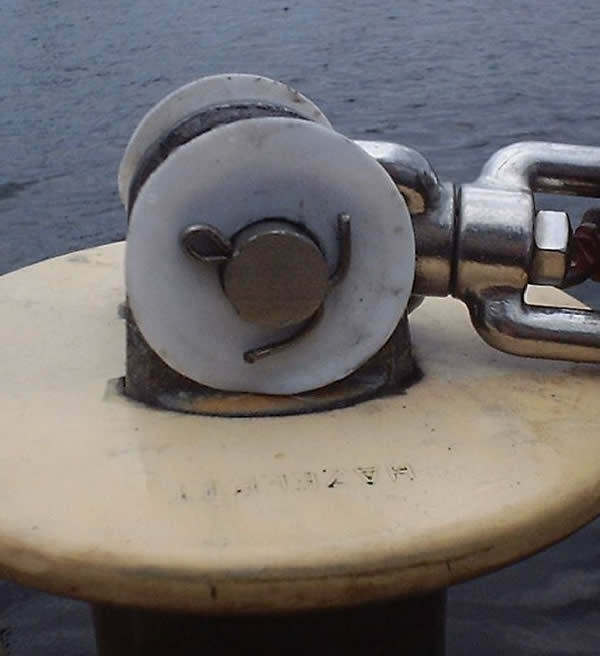 NOTICE: There are two styles of hazelett moorings in our mooring field. If your rubber bumper is the "large" type (8" diameter) and your hazelett looks that in Figure #2 (the rectangular ears are 5/16" closer to each other), you will need to modify your bumper slightly. Simply remove an appropriate amount of rubber material from each of the two slots. This is more easily, neatly, and safely accomplished with a jig saw rather than a knife! Teflon Discs: Two teflon disks are initially provided to every member by the Harbor Committee. The disks prevent wear from the stainless steel swivel on the inside of the hazelett ears, but only if they are installed correctly! Figure #3 is an example of how NOT to install the disks. Figure #4 is the correct method of installation, where the disks are INSIDE the ears. Failure to have two teflon discs on the inside of the ears WILL cause premature wear on the ears. 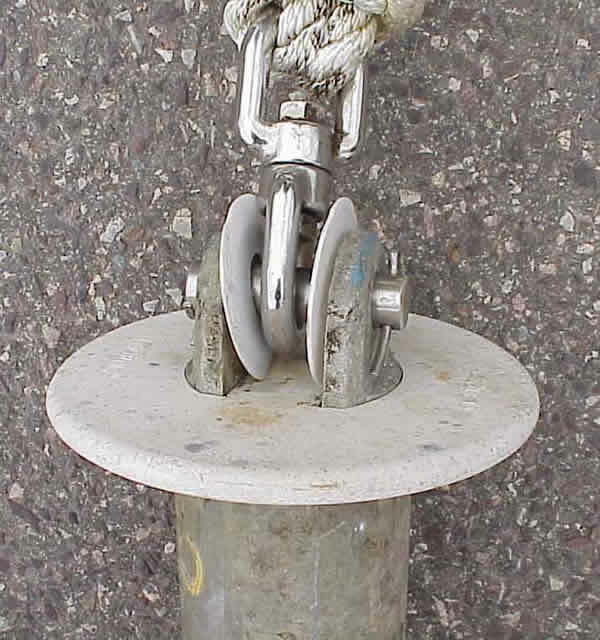 This could weaken the hazelett and cause failure of the hazelett and possible loss of your boat! Replacements may be purchased from Lakeshore Hardware or the HC chairman for minimal cost. 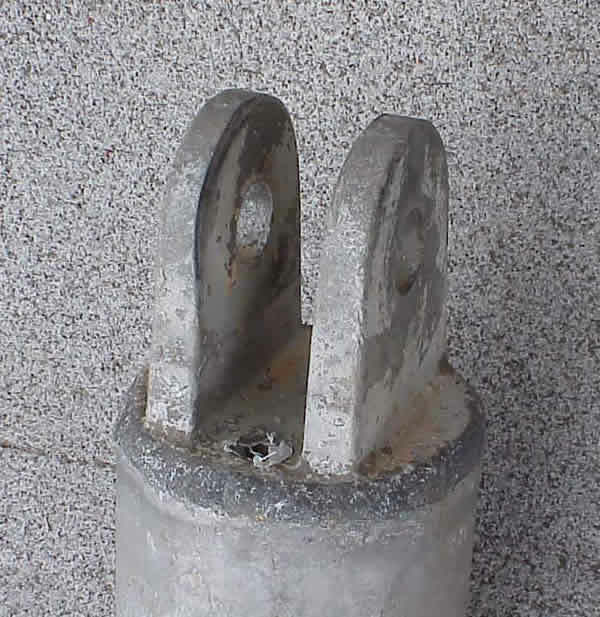 Cotter Pins: After installing the swivel and stainless pin, members often bend the cotter pins more than necessary. Bent or mangled cotter pins often make it unpleasantly difficult for you to remove the cotter pin before winter. Mangled pins also make it difficult for the Harbor Committee members during maintenance. An example of excessive bending is shown in Figure #3 above. The more preferred method is illustrated in Figure #5 in which only one leg of the cotter pin is bent, and then only far enough to ensure the cotter pin won't fall out. It also makes it easier for you to re-use in the Spring. It is suggested by the HC that you bend one cotter pin as shown in Figure #3. That cotter pin will be the one you will find with the red identification tag on it (see Figure #9 below). The other cotter pin that will be removed/installed on a yearly basis should be bent as shown in Figure #5. NOTICE: Some members prefer to not row out to a slippery and wet mooring on a blustery late October day, sharing an unstable dinghy with wet mooring lines! Contact the Harbor Chairman to have your lines removed and installed for a small fee. Quiz: Although the cotter pin looks OK, what's wrong with the installation in Figure #5? Decide whether you want one or two lines on your hazelett. 3/4" three-strand line is the preferred maximum size for the particular swivel we use, but line size may be limited by the size of your bow cleats. Line length should allow approximately 6-8' between hazelett and bow. 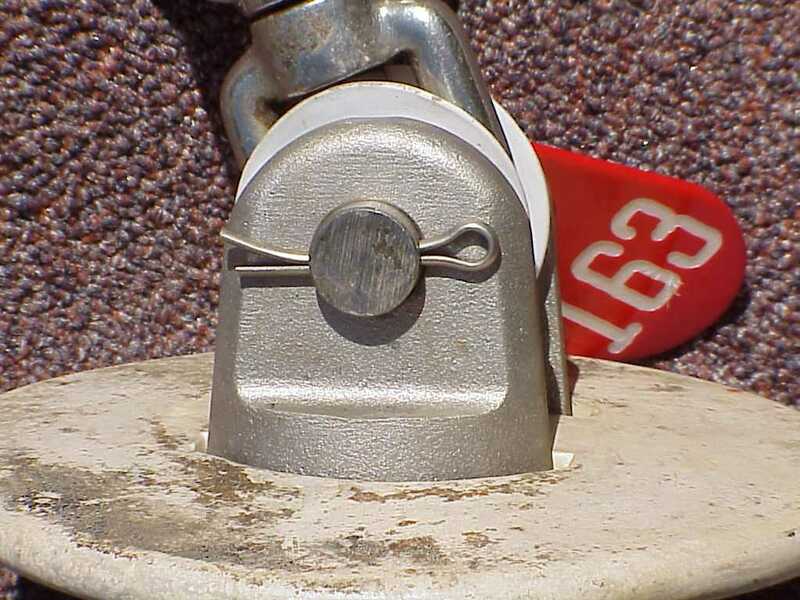 During low-water conditions it may be necessary to cleat your boat closer to maintain adequate swinging room. 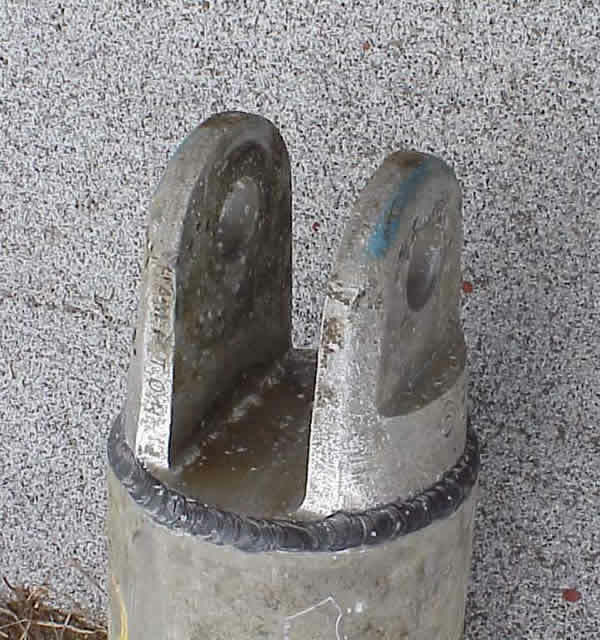 While there is a rubber elastomer in the ground tackle below the hazelett, the Harbor Committee recommends adding another one on your line for added shock absorption. (Members' boats that are in the 100' grid do not need an additional elastomer.) Install the elastomer within one foot of the hazelett to allow close cleating when necessary. One line: Have a 10" (inside) eye spliced into one end and secure that eye to the swivel as shown in Figure #6. Two lines: Purchase a single line twice the desired length. Fold it in half and secure the loop to the swivel as shown in Figure #6. An alternative method of securing two lines is shown in Figure #7 but line diameter must be smaller to fit the swivel. Cleating Recommendations: If you are an early season sailor and there are no other boats secured to their moorings in the immediate area where you boat is, it is acceptable to have a longer pennant from your boat to the hazelett. However, as the season progresses and the lake level goes down and more boats fill in around your mooring, it is suggested that you shorten your pennant. 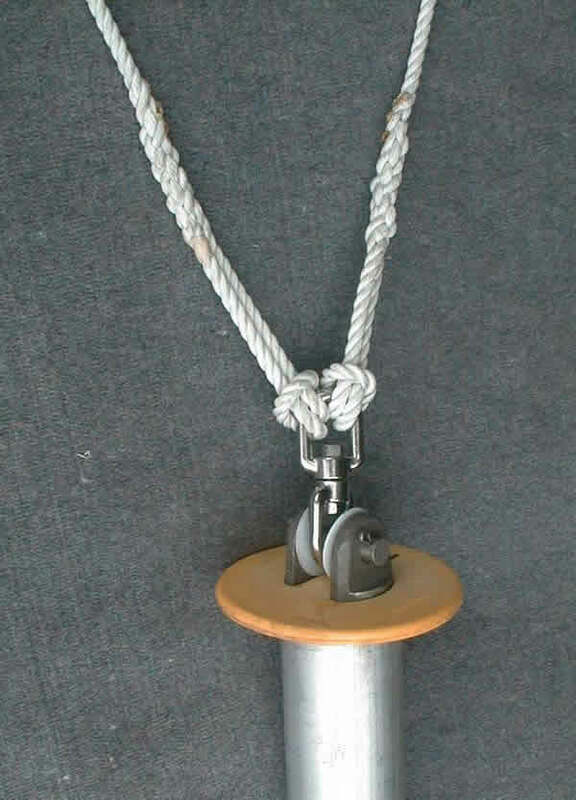 The Harbor Committee recommends that you adjust your pennant so that you have no more than 1' PLUS the amount of freeboard at your bow, between your bow cleat and the top of the hazelett. The purpose of shortening your pennant is to reduce the swing radius of your boat and to minimize the chance of your boat's stern contacting another boat's stern in dead calm conditions when the boats point every which way. If you should happen to go out to your boat and notice that your pennant has been shortened, please take note of how it is tied and how much shorter it is tied off. Repeat the process when you return from sailing. Doing so will provide increased safety for your boat. 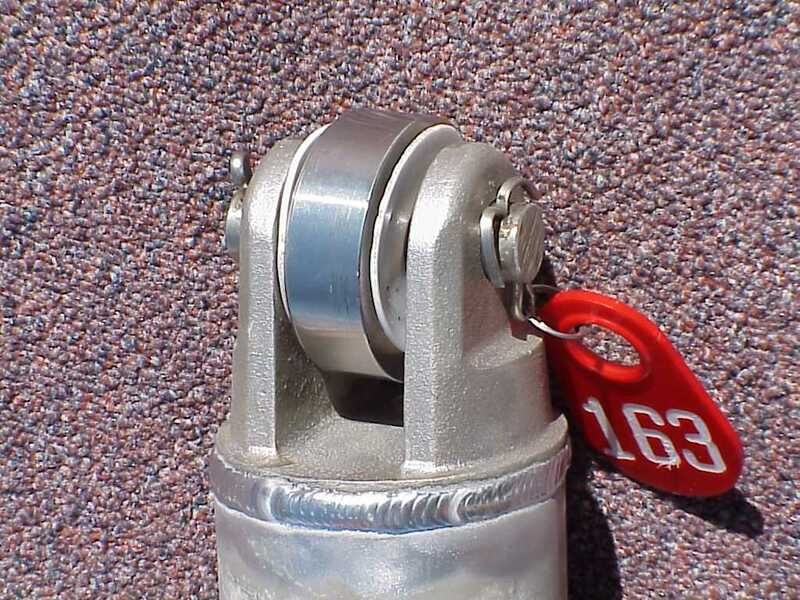 NOTICE: A member should NOT connect the mooring line directly to the hazelett without a stainless steel swivel. Doing so could endanger your and other members' boats and could (and does) damage various components of the ground tackle beneath the hazelett. 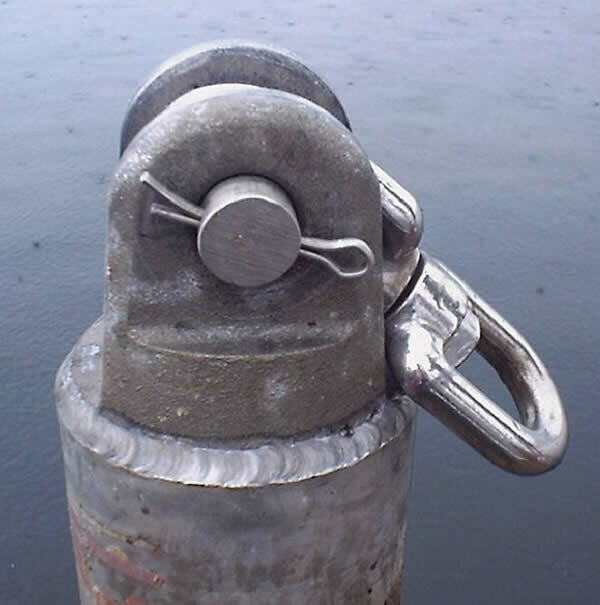 If you have misplaced the stainless steel swivel please contact the Harbor Chairman for a replacement. Each autumn, by two weeks after club closing all hazeletts need to be bare. During the winter months, the hazelett must be completely bare of all lines, swivels, rubber bumpers, gallon jug marker bouys, etc. The exception to this is the two teflon discs, pin, and the stainless steel donut (see Figure #8 below). You can also expect the Harbor Committee to facilitate that process, but it's your responsibility to accomplish it. Anything left on after that date will be removed by the Harbor Committee. Stainless Steel Donut: In an effort to reduce hazelett damage in the off season, the HC is reintroducing the stainless steel 'donut' as shown in Figure #8. The 'donut' weight is comparable to all the hardware that the members put on the top of the hazelett in the summer. The effect is that the hazelett will float as low in the off season as it does in the summer, reducing the possibility of damage in the winter. This program requires the club members participation to be successful. 1. Remove the cotter pin from the large pin in the top of the hazelett and set aside. 2. Pull the large pin out of the ears of the hazelett and set aside. 3. Remove both the teflon discs and the stainless steel swivel along with the rubber bumper. 4. Reinstall the large pin in one ear of the hazelett. 5. Position the s/s 'donut' as shown with the teflon discs on each side of the donut. Refer to Figure #9. 6. Push the large pin into the other ear of the hazelett and secure with the cotter pin, bending it slightly. Refer to Figure #10. 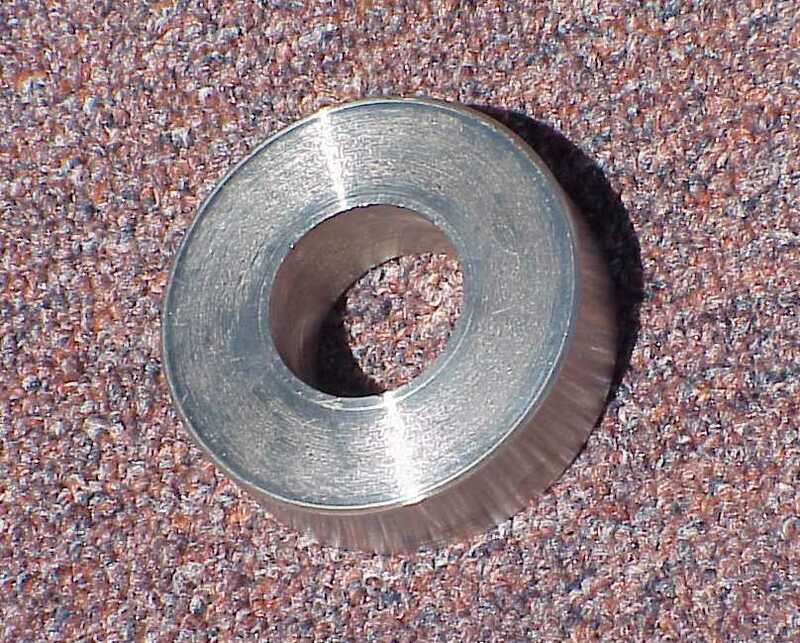 In the Springtime, reverse the process and store the stainless steel 'donut' on your boat so it is ready to use again in the Fall. If you have ANY questions or if you should happen to drop the 'donut' overboard, contact the Harbor Chairman for a replacement.